How NOT to destroy your home! Of course nobody actively tries to ruin their property, but do we all proactively try to protect our homes? Keeping an eye out for potentially costly problems and fixing them straight away is one of the best ways to keep your home at its best. Here are a few simple steps to help keep your property in peak condition. Blocked or broken guttering is the cause of many a damp problem. The gutters and associated pipework on your property are designed to carry rain water away from the building for effective drainage. If they become blocked or broken, the water can leak on to the external walls of your property – potentially causing damp issues over time. Problems might only be evident when it’s actually raining. If you do have a heavy downfall – try to keep a look out for any sign of leaking. After autumn’s heavy fall of leaves, the debris may build up in your gutters and stop them from working properly. If this is the case, they’ll need to be cleaned. Sorting out guttering will obviously involve working at height, so it may be best to pay a professional. Your gutters may be out sight out of mind all the way up on your roof, but sorting out any problems in the short term could avoid more costly damp issues in the long term. Damp is every homeowner’s nightmare. If there is evidence of damp in your home it’s very wise to address it immediately before the problem escalates. Your home may feel and smell damp, or you might see actual evidence of it on your walls or in cupboards. If you think you have a damp problem, get a professional damp survey carried out as soon as possible. From personal experience, Rentokil offers a comprehensive damp service. Rather than simply monitoring moisture levels in your wall, the Rentokil representative will drill a small hole into the heart of the wall to fully assess the extent of the damp. This can help rule out rising damp issues, which can be a more costly problem to rectify. Damp-proofing treatments (also known as damp coursing) and re-plastering can be fairly costly, but they can stop the problem from spreading and make your home environment healthier and more comfortable. It’s an obvious one – but don’t forget to replace the batteries in your alarm and do a weekly test. Aside from threatening your life, damage to your possessions and home from a fire can be extensive. Even a small fire that’s quickly contained can involve large clean-up costs and can be very emotionally distressing. For more advice on fire safety in the home, check out our article: Get firewise. If things do go wrong, having the right home insurance in place could help you cover the cost of putting it right. The amount of buildings cover you need is based on the rebuild cost of your home. Don’t confuse this with the market value – it’s not how much your property would sell for, it’s how much it would cost to completely rebuild it from scratch. For advice on working out your rebuild cost, try the BCIS rebuild cost calculator. Under-insuring you property’s structure or the contents inside it could leave you seriously out-of pocket. Bathrooms can be problematic rooms due to the fact they’re continually subjected to damp, humid conditions. When tiles are very old, they can sometime allow water to creep behind them and into the wall. Re-grouting and replacing silicone sealant around appliances is a positive step to making the room watertight. Look out for any consistently damp areas in your bathroom, sometimes pipes behind appliances have leaks that are not obviously visible. It’s advisable to keep homes and flats well ventilated. This is particularly true of older properties. It’s now standard practice to fit extractor fans to new properties, but if you have an older property your bathroom may not have one. If you haven’t got an extractor in your bathroom – it’s well worth considering one to control moisture levels. Check airbricks aren’t being blocked by furniture or any other objects – both inside and outside the property. Airbricks enhance airflow around the building and help to prevent damp and mould. 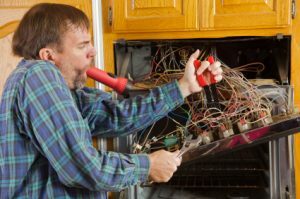 If in doubt, get an accredited professional to sort out your problem or fit a new appliance. This is particularly true of gas appliances, like boilers. By law, gas engineers are required to be ‘gas safe’ registered. For every trade, it’s a good idea to find out the official regulating body and check that the organisation or individual you’re think of using is part of it. Finding that you have mice or rats can be very upsetting and can make you feel as though your home has been taken over. Prevention is better than cure, so make sure you never leave any food out in your home. Readily available food is the main reason for rodent activity. If you do spot a rodent or find evidence that they’ve been in your property, you could try your local council as a first port of call. They will probably offer a pest control service (probably for a fee) that can determine whether you have an infestation and how to treat it. There are also a few measures that you can take yourself. Firstly, check to see where the rodent might be entering – e.g. block up any holes that access cellars or attics (remember that mice can fit through holes as small as a 50p piece). Try attaching mesh grills to any external airbricks as mice can sometimes enter through these holes. Plug-in devices that use ultrasonic and electromagnetic technology are available to scare away your four legged intruders and make your home unappealing for nest building. Apparently, the furry fellas also hate peppermint oil. It could be an old wives’ tale, but I dropped a couple of drops of peppermint essential oil into my floor cleaning liquid and I never saw a little mouse again. Could have been a coincidence – but I’m a believer!